How do I restore a web space? How do I restore a database? How do I restore an email backup? How do I restore a project in Website Builder? 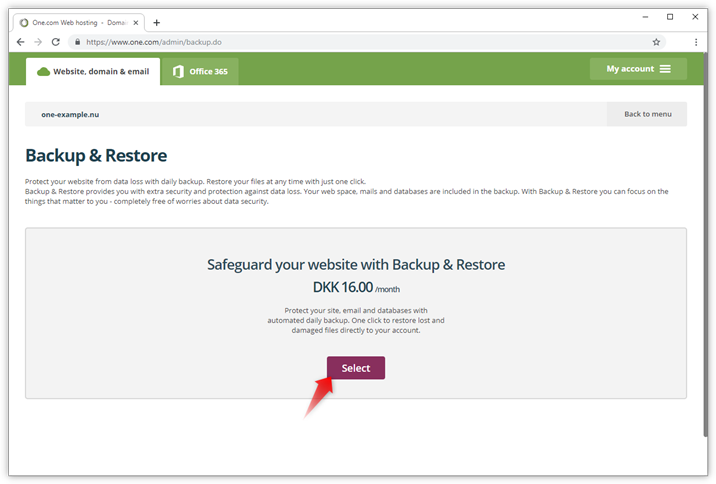 With Backup & Restore you can easily save and restore backups of your web space, databases, email accounts and Website Builder projects. You can find it in the Control Panel. Backups of your web space, database and email are available of up to one week back. You can restore a backup, download it to your computer or save it on your web space in case you need it in the future. Keep in mind that if you save a backup on your web space it counts towards your disk space. 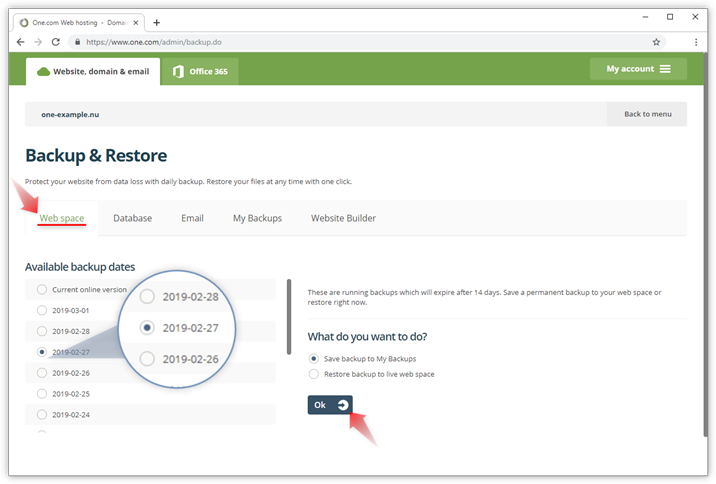 Backups of your Website Builder Projects are saved indefinitely. We keep up to 200 saved versions of your website. Backup & Restore is included if you have Website Builder Premium or a Professional Plus or Business package. It can be bought as an add-on product on the smaller packages. You can activate Backup & Restore from the control panel. Log into the One.com control panel and click Backup & Restore on the Files & Security tile. Choose how you want to pay and click Approve. You will be charged for the remaining months of the current subscription period. 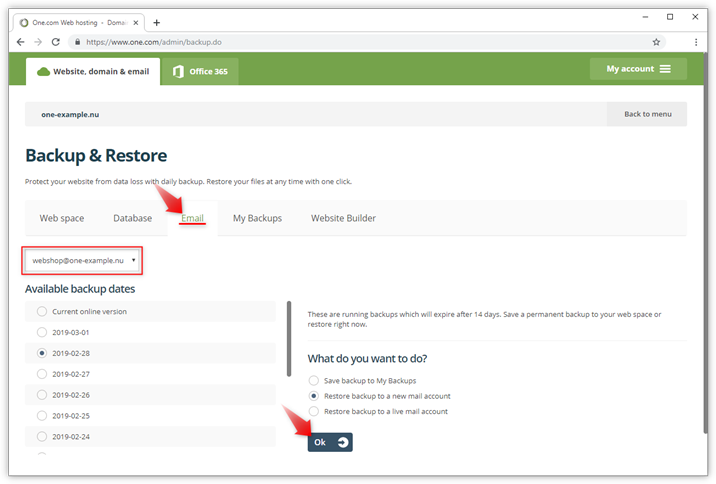 You can restore a backup directly from the available running backups under web space. Or choose one of your previously saved backups from My backups. Open Backup & Restore in the control panel and click Web space. Select from which date you want to restore the backup. Select Restore backup to live web space and click Ok.
Click Restore web space to confirm. Enter your control panel password and click Restore web space. The restore has now been initiated. You will be notified via email when it is done. You can restore a backup directly from the available running backups under database. Or choose one of your previously saved backups from My backups. Open Backup & Restore in the control panel and click Database. Select the database you want to restore from the drop-down menu. Select Restore backup to live database and click Ok.
Click Restore database to confirm. Enter your control panel password and click Restore database. 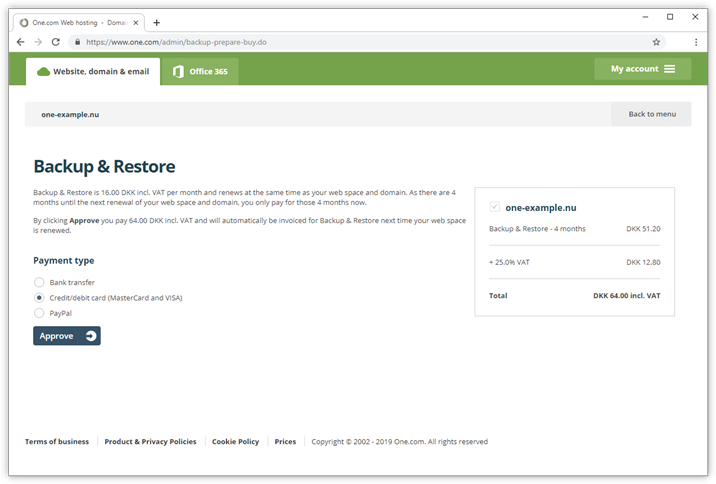 You can restore an email backup directly from the available running backups under email. Or choose one of your previously saved backups from My backups. Open Backup & Restore in the control panel and click Email. Select the email address you want to restore from the drop-down menu. Select Restore backup to a new mail account and click Ok. Enter a new email address and password and click Save. The address will be created at the same time that the backup is restored. Tip: If you want to merge your backed up emails to your standard email account, you need to do this in an email client. Set up both accounts with IMAP and then move emails and folders around. 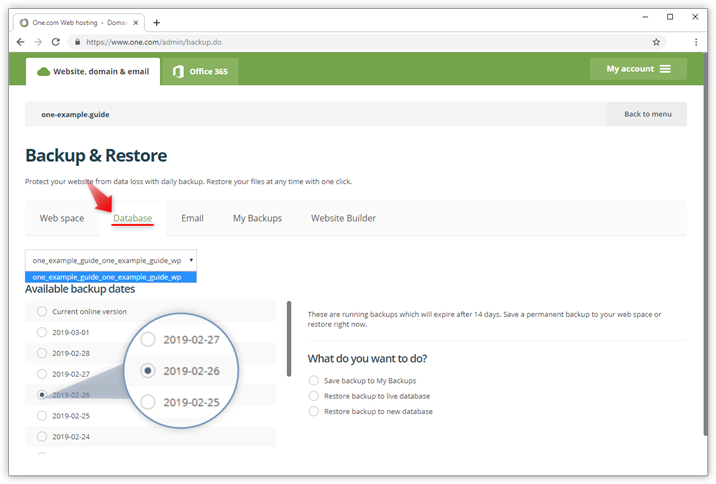 To restore a backup of your Website Builder project, you need to use the built-in backup function in Website Builder. We have created a separate guide for this, check it out below. 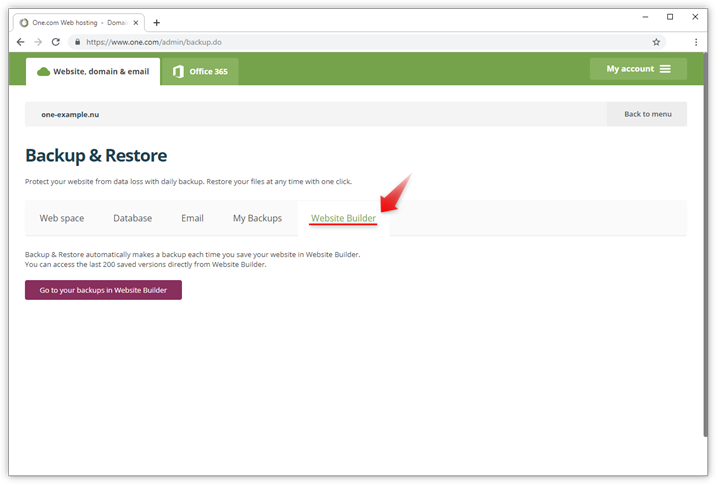 Note: Images and videos that you upload yourself, are not part of the backup in Website Builder. These images and videos are by default shopd on your web space, in a folder called 'onewebmedia'. We recommend that you make a separate backup of the content on your web space regularly.